“What’s your favorite scary movie?”, a question uttered by every single horror fan at some point or another, and also an iconic line from an iconic scene in an iconic movie that just so happens to be my favorite scary movie, Scream. For the month of February, the team at the Syndicate decided to have our Horror Hall of Fame inductee be a movie from the 1990’s. Obviously my suggestion was Scream, and while I’m clearly biased, there is no denying that is deserving of this honor. spawned three sequels, and a tv series loosely based on the franchise. While each of the films are great in their own way, none of them come close to the first. Scream is truly a one of a kind film. The satirical nature of Scream obviously makes for great comic relief, I mean that’s what satire is for after all, but to me, the self awareness that it causes makes it more realistic, and therefore even scarier. The killer in Scream, known as Ghostface, isn’t just some homicidal maniac who seems to be a supernatural force. Ghostface is a real person who has a real motive, and actually comes off that way, along with all of the other characters. Written by Kevin Williamson, Scream does a remarkable job creating a film full of characters that are the perfect mixture of cliche, stereotypical qualities, and relatable ones, that make them seem like people that you could bump into on the street, and not ones that are clearly fictional. 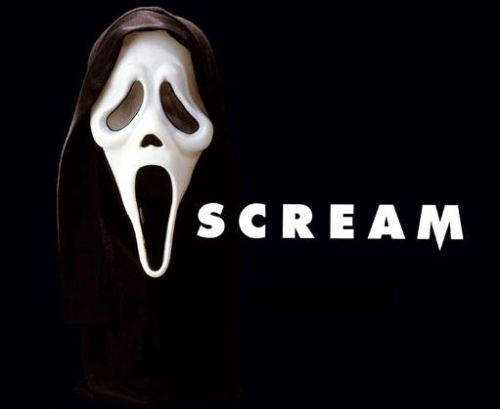 Nowadays it’s quite common for a character in a film or show to reference a piece of horror when they find themselves in their own creepy situation, and Scream was really the film that really set this in motion. If this happened in real life, whether someone has seen one horror film, or them all, the truth is they would probably base what to do or not do on what characters in horror have done, so why not have the characters in your movie act this way as well? It was a smart move, that once again made the film feel all the more real, and upped the scare factor. Clearly, I love the satirical/realistic feeling of Scream, but that’s not the only good thing about the film. It also has very quotable dialog, like that that I opened this piece with. Although, some of the lines, including the “What’s your favorite scary movie?” one, may not seem that spectacular out of context, but when you look at them within the film, they are really great. A favorite of mine that would definitely fit in that category is Stu’s “Aw man, my mom and dad are going to be so mad at me!” line that he says when *SPOILER ALERT* Sidney says that she’s called the cops on him and his best pal/her boyfriend Billy who were the ones behind the Ghostface mask(s) the whole time. A good amount of the iconic quotes from the film do dwell from the “meta” aspect, or self awareness that it has, for example, the rules that Jamie Kennedy’s horror loving character, Randy, sets forth. Not all the memorable quotes are fun, and silly ones like that, though. My absolute favorite quote, probably from any movie ever, is “Movies don’t create psychos, movies make psychos more creative.” , and I think it’s a really important thing for people to remember; to not fall into the trap of thinking that anyone who likes horror,etc are bad people/the bad people that do like those things aren’t bad because of them, which is very ironic considering that the Ghostface mask has been used by criminals to hide their identity ever since the movie was released, and therefore said to inspire these people’s crimes. Another notable thing about Scream, are the kills. I may not be one of those horror fans that is all about the kills, but if you are, then Scream doesn’t disappoint in that area either. Right from the get go, with that iconic Drew Barrymore scene where Ghostface keeps his promise of gutting her character, Casey Becker, like a fish, Scream’s kills are bloody, and rough. I don’t know about you, but dying by being squished in my garage door, like Tatum, is definitely high up on my list of ways I’d rather not be killed like. Scream is just an all around great horror movie, that can easily fit a lot of people’s tastes. It is very much a movie made for horror fans, but It’s the perfect horror movie for a lover of the genre to watch with their loved one who isn’t too fond, or familiar with it yet, due to the references, gorey kills, witty dialogue, and just the perfect amount of scares that don’t make it too intense for the newbies, but still enjoyable for those who’ve been here awhile. Here are some options is you would like to have Scream or the entire series in your collection.